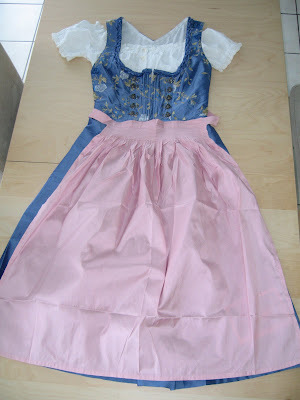 Walking in Stilettos on Cobblestone Streets: Check out my Dirndl! After attending 3 Oktoberfests where I wished that I was wearing a dirndl, I finally got one! (see pic above). I received excellent advice in selecting one... I especially love the blue & pink colors. Really nice dirndls can cost between 700-1,000EUR*. Cheaper ones can be found at C&A or at Halloween stores in the US (although these aren't the real ones). There are strict "Bavarian drindl wearing" laws, which stipulate that dirndls can only be worn during Oktoberfest or on a religious holiday. No Halloween wearing is allowed. :( Although, I'm all for dress-up with them around the apartment! *Lederhosen are even more expensive since they're made of soft leather and have gorgeous designs sewn into them. Apparantely ledershosen are even more complicated to put on. And "washing" them is done by brushing them with a brush (no water). The guys look very cute wearing them!